Now that iOS 9 is available, one of the question everyone seems to be asking at the moment is whether it’s worth upgrading to from iOS 8? A new video on YouTube tries to answer this by pitting iOS 9 against iOS 8.4.1 across most iOS devices all the way from iPhone 4s to iPhone 6 and iPhone 6 Plus. Check it out after the break. As you can see in the almost-nine-minute long video, the YouTuber explores a number of aspects of iOS, including storage, WiFi speeds, app launching times, cold boot times, and even the somewhat scientific Geekbench test. While the video is worth watching in its entirety, the bottomline is, iOS 9 doesn’t really offer a lot of performance improvement over iOS 8.4.1, as can be seen in the video. It does however give significant boost to WiFi speeds. So. should you update to iOS 9? That depends. 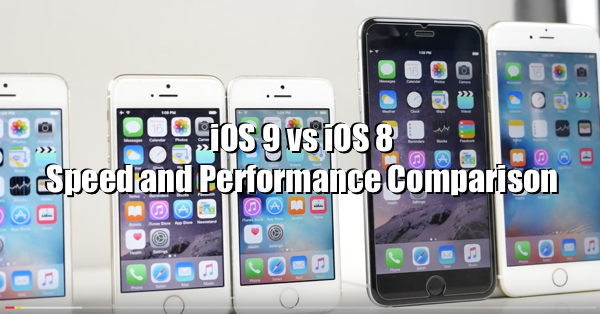 Based on what the video comparison shows, if you are running iOS 9 on relatively newer devices – namely iPhone 5s or 6/6 Plus, you should probably go ahead and do it as the performance on those devices is generally good. However, iPhone 4s and iPhone 5 users may want to hold out due to performance issues. Personally, I have a spare iPhone 4s for testing purposes that I upgraded to iOS 9 this morning and have since been using it fine without any major performance downgrades. The new software didn’t make my 4-year old iPhone 4s miraculously faster, but it didn’t have any detrimental effect either compared to iOS 8.x. Everything is mostly like it was before, so I don’t see why you shouldn’t take the plunge. The good news is that Apple is already working on iOS 9.1 which is expected to fix a lot of bugs and performance issues that slipped through in iOS 9. Based on how betas have already been made available to developers for this version, we can expect a final release sometime in October or November this year. Check out the video below and let us know what you think about it in the comments section below.